The Curious History Of Book Blurbs (And Why they're Still Around) Those snippets of praise on book covers have been around for over 150 years (at least). But how do they get there — and why? The answers are more complicated, and compelling, than you might think. Whatever the old adage might warn, there is a bit of merit to judging a book by its cover — if only in one respect. Consider the blurb, one of the most pervasive, longest-running — and, at times, controversial — tools in the publishing industry. For such a curious word, the term "blurb" has amassed a number of meanings in the decades since it worked its way into our vocabulary, but lately it has referred to just one thing: a bylined endorsement from a fellow writer — or celebrity — that sings the praises of a book's author right on the cover of their book. They're claims couched in quote marks, homes for words you might never hear otherwise — like compelling, or luminous, or unputdownable. Heck, at least three books have reportedly inspired celebrated memoirist Frank McCourt to say "you'll claw yourself with pleasure." Nearly as long as they've been around, they've been treated by a vocal few with suspicion, occasionally even outright snark and scorn. Author Jennifer Weiner, for instance, sees some value in them, but suggests they've been getting over the top; scholar Camille Paglia, not one to mince words, called them "absolutely appalling" in a 1991 speech. And if no less a luminary than George Orwell — way back in 1936 — credited the decline of the novel (even then!) with "the disgusting tripe that is written by the blurb-reviewers," one question naturally arises: Why are blurbs still around — and still, at least among publishers, so popular? As it turns out, the answer is a bit complicated, long-lived and even a little bit (dare I say it) compelling. The life of a blurb excerpted from a critic — a book review, say, from NPR — is a fairly simple one. 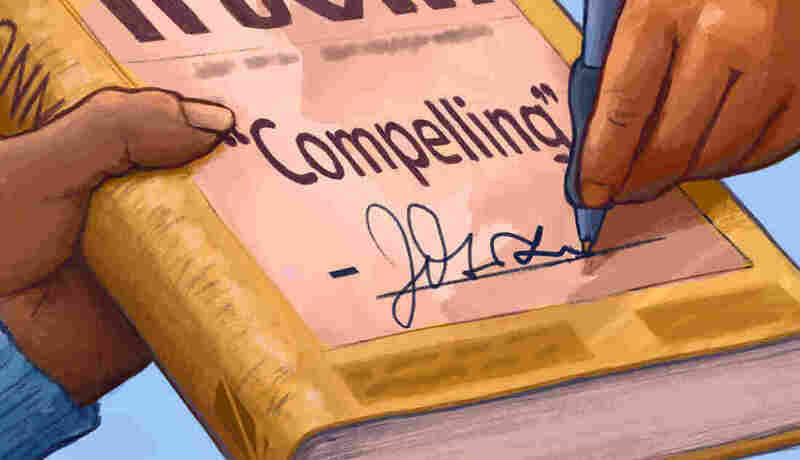 A recognized critical institution writes a positive review; that review comes to the attention of a book's publisher, who then puts a positive quote somewhere on the book. But well before the book's been seen by critics, well before it hits store shelves, its manuscript is passed around for praise from a writer's peers. "When we start thinking about a publicity plan, you talk about what's going to be important. And so one of the first things to come up is: 'Are we gonna go after blurbs?' " says Kimberly Burns, a co-founder of Broadside, a literary publicity firm. She says the process begins usually around the time that a galley — a bound manuscript of a book, prior to copy editing — is ready to send out. And it begins with a conversation between the author and her editor, an attempt to cobble together a list of prospects to whom they'd send galleys. Before Laila Lalami began seeking endorsements for her latest novel, The Moor's Account, she says she met with her editor over lunch to divvy up their lists. "There were a couple of authors he was friends with, so he made the requests himself," she writes in an email, "and others I was closer to, so I wrote those emails directly." As a writer requesting blurbs, Lalami says the idea is to find "an endorsement from someone who is a good fit for the subject matter, has a very strong reputation, and rarely blurbs can have a significant effect on tastemakers." I can figure things out pretty quickly. I'll look at a first sentence [of a galley], I'll look at the cover and it just comes to me. ... Sometimes I try to read further — but you know, how far can you get? But, when you're on the other side of the requests — as the author writing the endorsement — the process varies more from person to person. Some writers report receiving up to five unsolicited galleys in the mail a day, a deluge that's prompted plenty to swear off blurbing altogether. It also prompts a question: How do all the other blurbers do it? "I can figure things out pretty quickly," says Gary Shteyngart, a novelist and memoirist who has polished the practice into an art form. He's given so many blurbs (more than 150 by his counting) that there's even a Tumblr devoted to some of his more notable snippets. "I'll look at a first sentence [of a galley], I'll look at the cover and it just comes to me," he says. "Reading randomly from a book is also very helpful. Sometimes I try to read further — but you know, how far can you get? Does anyone even read these books anymore?" That said, he doesn't hold back. "I've compared people to Shakespeare, Tolstoy or whatever," he says. "I'll do anything." Still, he — and Lalami — remain ambivalent about just how effective these are in getting a book noticed by readers, especially since there are so many blurbs now in circulation. "I think the blurbs that people write for me are pretty heartfelt, and I appreciate them," he says. "But ultimately what effect they have — I don't know. If we could all enter a memorandum of not blurbing anyone else, I think it would be easier for us." 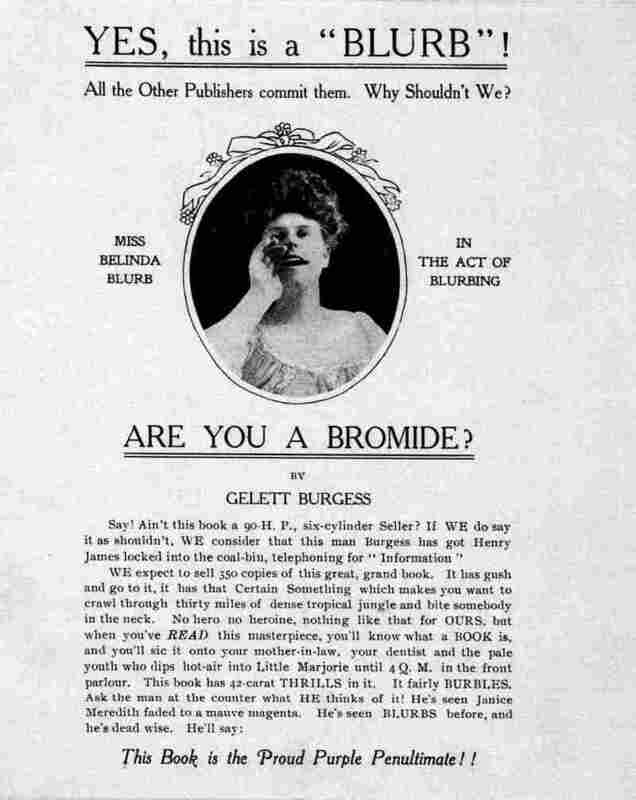 Whatever the future may hold for this arms race of blurbs, its roots stretch much further into the past than Lalami and Shteyngart, further than Orwell or even the guy who came up with the word "blurb" in the first place — humorist Gelett Burgess, whose 1907 book Are You a Bromide? featured a woman he called Miss Belinda Blurb, extolling the book's manifold virtues from its cover. Burgess may have invented the word (and defined it as "a flamboyant advertisement; an inspired testimonial" — or, "a sound like a publisher"). But the practice it describes had been alive and well for at least a half-century before Burgess got to it. In fact, many trace its conception to one of the titans of American letters: Walt Whitman — making use of a letter of his own, sent to him from Ralph Waldo Emerson. On reading the first edition of Leaves of Grass, which had been sent to Emerson unsolicited, Emerson had mailed Whitman back a glowing note. At that time, Emerson was already a nationally esteemed intellectual, while Whitman was a relative unknown outside his native Brooklyn. The note began as a private word of encouragement, but it wasn't private for long: The New York Tribune published it in full with Whitman's consent just months later. "I greet you at the beginning of a great career." "I have not seen any blurb before that. I know scholars have looked, and I don't think anybody has been able to locate one," says David Haven Blake, a professor and author of Walt Whitman and the Culture of American Celebrity. "I suspect in one sense that is the first blurb — though Whitman wouldn't have described it in such a way." Whitman, it seems, was very adept at self-promotion — "a one-man publicity shop for Leaves of Grass," Blake calls him. Jerome Loving, who wrote Walt Whitman: Song of Himself, adds: "It's not surprising that the poet who began his first great poem with the words 'I celebrate myself' would be one of the originators of the book blurb." 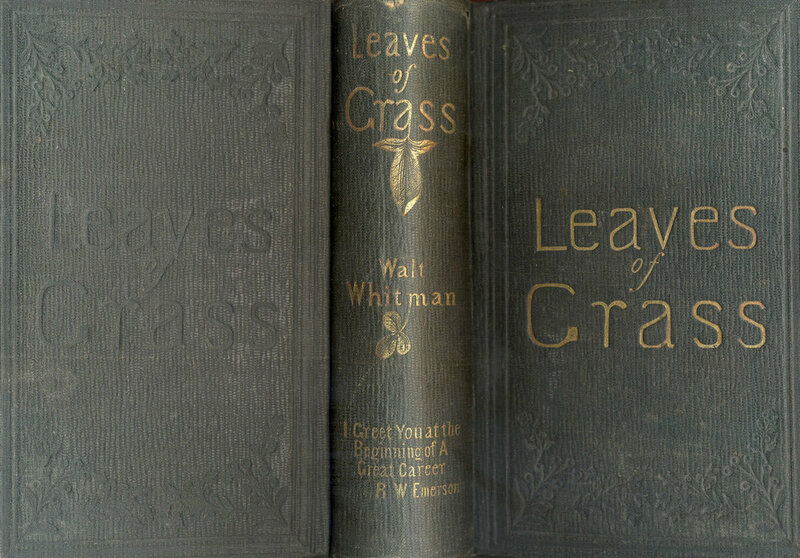 A shot of the 1856 edition of Walt Whitman's Leaves of Grass, with Emerson's blurb on the spine. Considering its remarkable endurance — and its pervasiveness today — one might expect the blurb to be a prime way to move copies. After all, it was pioneered by a poet with a penchant for self-promotion. Wouldn't the right blurb, placed just right on the book's dust jacket, be a recipe for great sales? The thing is, few people seem to know for sure. "I'd say it's nothing that we can track," says Carl Kulo, the U.S. director of research for Nielsen Bookscan. On a monthly basis, in collaboration with publishers, Nielsen conducts a survey of some 6,000 book buyers across the country, asking about the books they bought, where they bought them, the formats they were in and how they became aware of the books. The questionnaires change just about every month, and of course the results do, too. But Nielsen doesn't ask about how blurbs influence purchases; he says publishers haven't asked Nielsen to track that data, either. "It doesn't exist," he says. "To be honest with you, we never thought of it." Yet there is at least one group keeping tabs on this information. At Codex Group, an independent audience research firm, founder and CEO Peter Hildick-Smith says he has worked with every major publisher and many major retailers to test the sales success of a book's cover before it hits store shelves. Using samples of several thousand participants each, Codex tests three or four possible variations of a book's cover — usually including one that's entirely bare of blurbs. Then, they test how participants pick. There's just this vast blizzard of books coming out all the time, and getting any one book to stand out and catch people's attention is extraordinarily hard work. He says he's found that two factors are key to a blurb's success. "Do you care about who's doing the blurbing, and is it somebody who really matters to you?" says Hildick-Smith. "And is it something that's really bringing some value to your understanding of the book?" And yet, even when the blurber is a reader's favorite author, Hildick-Smith's numbers show that such recommendations have only a modest influence on their buying habits. Asked about the book they bought last, just 2.5 percent of participants discovered it through the recommendation of their favorite author; about 1 percent of them were persuaded to buy a book because of such a recommendation. About as many participants discovered their last book through an author recommendation as those who found it with a search engine. If the sales impact of the blurb is, at best, a small part of a larger mix of a book cover's attractions — or, at worst, a negligible one — the question appears to persist. Why blurb? Well, the short answer is: The blurb isn't exactly meant for readers — at least, not entirely. By the time a blurb gets to the reader, by the time it's resting on a book in a display, it has already done most of the work it's supposed to do. Pietsch entered the publishing industry in the late 1970s, by which time, he says, the process of soliciting blurbs was already well established. A longtime editor himself, Pietsch says, "The editor's job is to get people to read the book" — and that job has been getting started earlier and earlier in the process. Editors aren't just trying to get the reader to buy into their authors' work, but the staff in house at a publisher, as well. "People's reading time is very limited," he says. "And you want them to actually have the pleasure of this book, so that they can talk about it with that full-hearted enthusiasm that you really only get when you've actually read it and loved it." And that's quite a task, considering the number of books getting published: He says that 300,000 books were released last year alone by the mainstream publishing industry. "There's just this vast blizzard of books coming out all the time," Pietsch says, "and getting any one book to stand out and catch people's attention is extraordinarily hard work." For most of those books, the path from manuscript to store shelf can be loosely thought of as a chain. From agent, to editor, to publicists, to booksellers — the prospect of a book standing before the eyes of a potential buyer depends largely on persuading each link in that chain to give it a read. It's a challenge that gets even more difficult with writers new to a U.S. audience; that's one reason why Laila Lalami says she tries to blurb "especially if it is a debut author, or an author in translation." 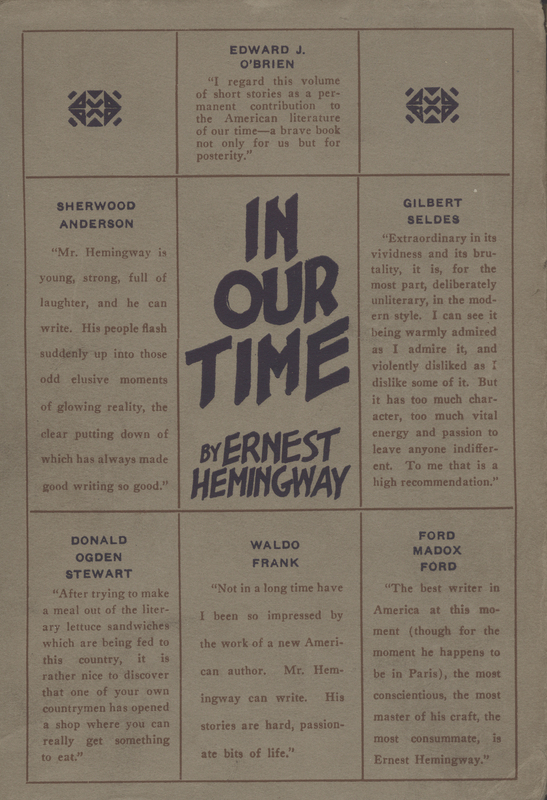 The 1925 edition of In Our Time, by Ernest Hemingway. Back when he was virtually unknown by readers, Hemingway turned to blurbs, too — getting endorsements from the likes of Sherwood Anderson and Ford Madox Ford. It's no coincidence, then, that Whitman, a longtime newsman, borrowed a bit of Emerson's prestige to gain traction in the literary world; nor that even Ernest Hemingway, Pietsch points out, squeezed no less than six endorsements onto the front cover of his first commercially published book in the U.S., In Our Time. Another editor likened blurbing to scholars advising Ph.D. candidates — with established writers supporting apprentices just getting their start. And at least in this instance, Jake Cumsky-Whitlock says, the blurb works. As the head book buyer at Kramerbooks, he decides what stocks the shelves at the Washington, D.C., bookstore, and he says that blurbs serve to position an unfamiliar name by familiar beacons. "It's less for what the blurb says than who's doing the saying," Cumsky-Whitlock says. "If I haven't heard of the author writing the book, but it comes with the imprimatur of a reputable writer or someone I respect, that will make a big difference." Ultimately, that kind of reaction is enough — for the writers doing and receiving the blurbing, for the editors and the publishers. "My job is to help out a little bit," Gary Shteyngart says. "If a crazy person sees my name on the back of a book and says, 'I'm gonna pay $25 for this,' then I've done it — I've done a great service to my community.